Adam Schaeuble, aka The PHD (previously heavy dude), is the host of the top ranked fitness podcast ‘The Million Pound Mission'. He reached a point in his life where he weighed 327 pounds and was already having weight related health issues in his late twenties. He decided to overhaul his lifestyle and his fitness and ended up losing over 100 pounds. Feeling inspired, he took what he learned from his own transformation journey and created a bootcamp program that produced over 35,000 pounds of results in his home town of Bloomington, Indianna. 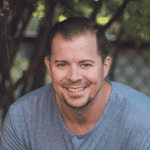 Now Adam has set his sights on inspiring over one million pounds of healthy results through his podcast, online academy, and online bootcamp program. I think it's helped me really deal with anxiety a lot. I've been in the hospital a few times from entrepreneur itis, working too many hours and you know, anxiety attacks, and taking on too much. So being mindful, being present in the moment has allowed me to have like a filter to sort out what is actually happening and what do I actually need to be worrying about? Breathing. I follow a meditation practice that's involved with breathing. Just being able to have control of whether it's box breathing or just doing kind of a silent meditative practice where I'm just focusing on the breath. I love just doing breathing where I breathe in, count one, breathe out, count to 10 and then cycle through that a few times. And it's just a nice little reset where I can actually do that in between tasks if I'm kind of switching modes from, okay, we do this interview and now I have to do some client calls. I'll do a little bit. I use that to kind of pause and breathe. Well, I think there's a unique thing that happens when somebody loses a lot of weight and we kind of bully ourselves a little bit. Like there's a moment where we beat ourselves up. We lose that confidence. And like I said, we assume that other people are making fun of us so people will beat themselves up a lot along the journey about not being there yet. Maybe they've lost 60 or 70 pounds, but their goal is 80, 90 pounds and they beat themselves up about not being there yet. They're not being present. They're not realizing like, hey, I've accomplished something amazing and be proud of that. So it's probably not the traditional bullying answer that you get, but I feel like, let's start with us. Like don't beat our selves up. Don't be hard on our own self, especially when we're accomplishing amazing things, you know? Be Proud of yourself. There's a coach I've got named Dan Sullivan; he talks about something called the gap and the gain. He says you have to always measure from where you started. That's the gain. Don't measure the gap between where we are now to where we want to get to be because that's like the horizon line and getting there never happens because what happens when we hit our 50 pound goal. Okay, I want 60. Okay, I hit that. Okay. I want 70. If people don't take that moment to breathe and be present and realize that, you know what, that's pretty damn awesome. And like, we all do this, whether it's with weight loss, with anything. I do my affirmations, I still do my lifestyle rehabilitation. I still do it all and I just accomplished another major goal. I paid off my mortgage and I'm mortgage free. I'm 100 percent debt free and I took a few days. I just like, I just, I wasn't going to set the new goal, I wasn't going to set the next thing. I just sat down and just kind of walked around my house and I'm like, this is mine. I don't have to worry about that debt anymore. I can take that and invest in my retirement. I just really got into the moment, celebrated that with my kids, my family, and we talked about it. My son's seven. I talked to him, like I'm going to help, you know, put more money towards their college, he doesn't understand any of that, but I just communicated it to him, but just kind of being in that moment, being present, being mindful and being proud.